One of the larger STDN stations is located at Rosman, North Carolina, and is shown in Figs. 8-8(a) to 8-8(d). The aerial view in Fig. 8-8(a) shows seven of the station's tracking and data acquisition antennas. The largest ones are two 26-m telemetry antennas at either end of the large clearing just above the center of the photograph. (Closeups are shown in Figs. 8-5 and 8-8(b)). In the clearing above and to the left of the large antenna in the center are two Satellite Automatic Tracking Antennas (SATAN). The two antennas in the clearing in the lower left corner of the aerial view are range and range-rate antennas and are shown in Fig. 8-8(d). Finally, the VHF Satellite Command Antenna on Medium Pedestal (SCAMP) antenna of Fig. 8-8(c) is in a small foreground clearing along the righthand edge of the aerial view. •The Jet Propulsion Laboratory (JPL) Deep Space Network (DSN) handles communications for interplanetary missions. Because of the long distances involved, this system uses the 26-m antennas in Madrid, Spain, and Goldstone, California. Table 8-3. 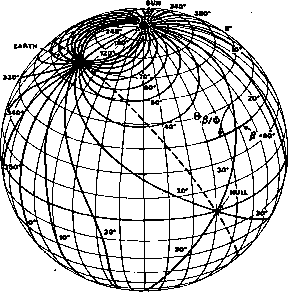 Geodetic Coordinates of STDN Stations Tracking System, Referenced to Fisher '60' Ellipsoid, Semimajor Axis=6378166 m and I /flattening=298J. (See Appendix L for the transformation to geocentric coordinates.) 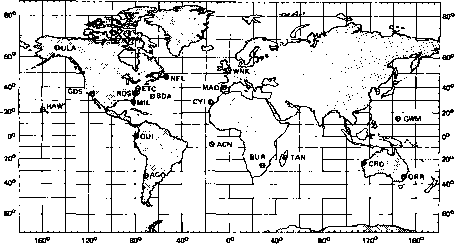 System locations are subject to minor changes as refinements in positional accuracies are made.